Welcome to the BL Precision website. 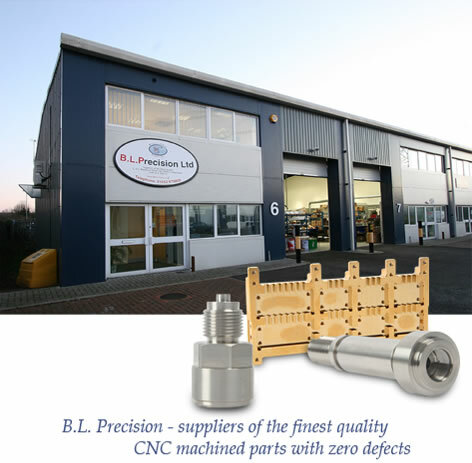 We are suppliers of the finest quality CNC machined milled and turned parts and are based in Letchworth Garden City in Hertfordshire, UK. Whatever machining needs you require, we will be happy to turn your engineering designs into reality. With many facilities under one roof, we can be your single source solution for CNC turning and milling work. Having been established for over 23 years our highly skilled and experienced team can produce components for you up to 1 metre long in batches from a single prototype up to low volume production (5,000 off) and all to the high standard our regular customers take for granted. © 2008 B.L. Precision Ltd.
Site produced by Zone 1 Media | Managed by CBJ Digital Ltd.